It’s a truism that marriage is about compromise–but it’s even better when you can get to win/win. Here’s how I think it works: you begin by finding out that you have so much in common and you think you’ve found your soul mate. Then when you live together, you discover little things that you didn’t know about that can irk. You realize (if you’re lucky) that the good outweighs the bad and that you can compromise and, if you’re really lucky, you can get to win/win. In my case, Mr. Dot and I loved the same foods. When we were dating, we would joke that one of us could leave the ordering of the food at a restaurant to the other. But when we set up house together I discovered, to my shock, that he likes mayonnaise.. I really can’t stand being around the stuff any more and if Mr. Dot eats something with mayonnaise (like the egg and cheese breakfast sandwiches he sometimes makes himself) then I don’t even want to wash the plate. I felt a little guilty about this because I changed the terms by growing from mild dislike to revulsion only after we tied the knot. Of course it would be ridiculous to blow up a good thing because of the mayo issue and so: homemade mayonnaise. I am fine with eating raw eggs in mayo, mousse or a guggle-muggle (which is a traditional Jewish family cure for a cold—often milk and honey (one version I grew up with—but my surefire version is oj, honey and raw egg). I don’t have a regular raw egg mayo recipe—whenever I make it, I get out the egg yolks, oil, lemon juice, mustard, and garlic and then reach for a cookbook and glance at a recipe just to get the proportions right. Since not every one is fine with raw eggs, I was delighted that Mark Bittman provided the solution in The Food Matters Cookbook: a bread based vegan mayo which made it possible for me, after all these years—to finally make chicken salad with leftover chicken which is perhaps the best cold lunch food ever AND something that Mr. Dot loves. 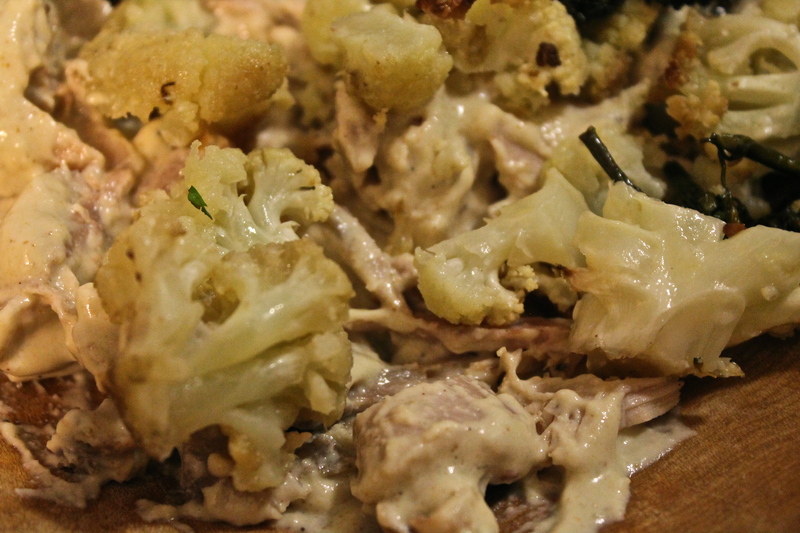 I have no special recipe for the chicken salad but recently had some leftover roasted cauliflower and added that and some dried currants to make a weeknight dinner that the whole family loved. That’s right: win/win/win. Wet bread with a few tablespoons of water and then squeeze most of the moisture out. There’s no need to be obsessive about squeezing out the moisture because you’ll want some of it. Add the bread, nuts, oil, and garlic to the bowl of a food processor and blitz away. 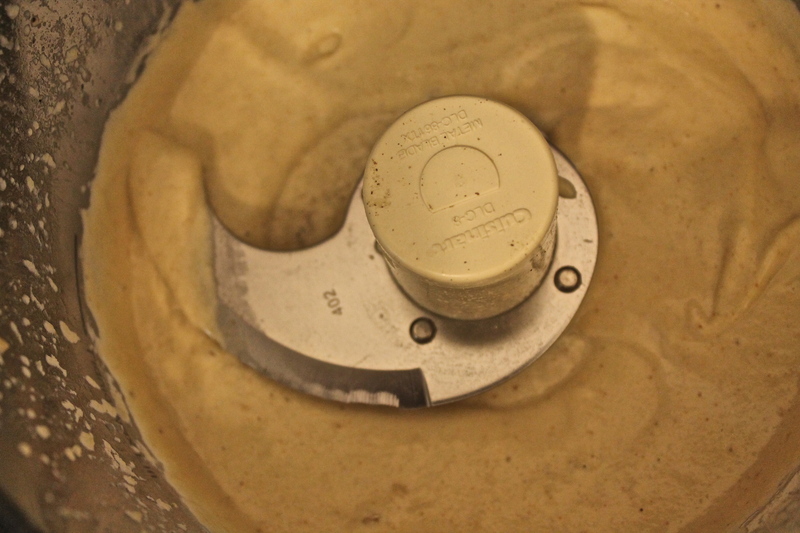 With the machine running add a quarter of a cup of water and a little more oil to form the mayo–you can play with it to get the texture you like. Add l emon juice, salt and pepper, to taste. 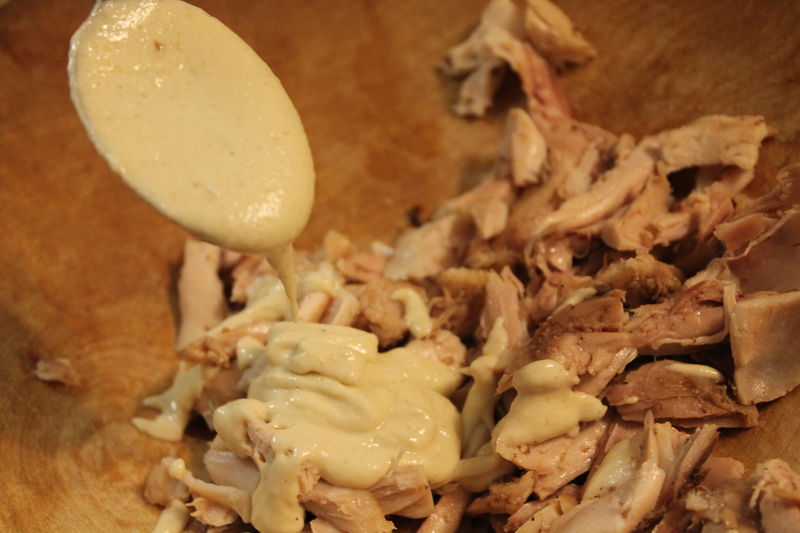 When you have good mayo, you can make great things with leftovers. Win/win!